On Wednesday, April 6, Disney Cruise Line officially unveiled the remainder of its 2012 cruise schedule at a press conference in New York City. A press conference for some cruise itineraries? That seems a bit much, unless there's something really good to share. And the announcement might have actually been exciting, had the news not leaked beforehand. Disney Cruise Line's new itineraries and ports of call were one of the worst-kept Disney secrets ever, thanks to a variety of credible rumors from crew members and the premature release of the official press release. The only question going in would be whether they would, in the words of Anton Ego in Disney Pixar's Ratatouille, surprise me. 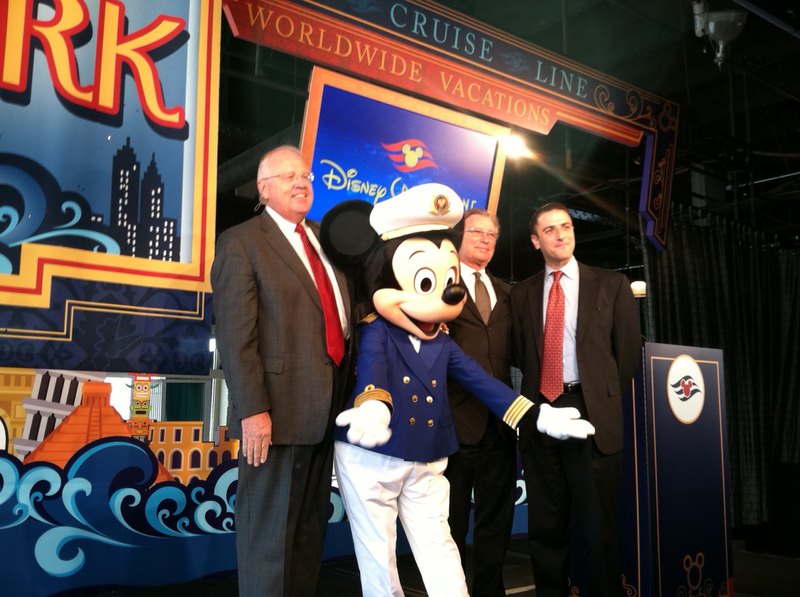 Mickey Mouse posts with Disney Cruise Line President and several NYC dignitaries during the announcement of the 2012 DCL sailing season in NYC on April 6, 2011. Would Disney Cruise Line unveil design details about their fourth ship, currently under construction, the Disney Fantasy? Nope. What character's statue would grace the new ships lobby, and which character(s) would dangle from the ship's stern? Nope. Was the leaked press release a ruse? Uh uh. Would they announce plans to add some of the Disney Dream's great new features to their older ships? Not a word. But Captain Mickey was on hand, cruise line president Karl Holz presented a concise overview of cruise line current events and the new itineraries, representatives from the City of New York expressed their happiness and appreciation for the economic benefits derived from the cruise line's first visit to New York, and everyone posed for pictures. Wait... Do you want to read about the business of press and publicity, or do you want to know about those cruises? And why all the fuss in the first place? The full 2012 schedules for the recently-christened Disney Dream and her sister ship, the Disney Fantasy (which enters service in March 2012) have been public for quite some time, but the schedules for the older ships petered out in April. So the question was, "What will the Disney Magic and Disney Wonder do from April 2012 through the end of the year?" May we have the envelope, please? (Captain Mickey actually did deliver an envelope to Karl during the press conference!) The Disney Cruise Line will be sailing from three new temporary home ports in 2012: New York City, Galveston,Texas; and Seattle, Washington. The cruise line will also be making first-time visits to Hawaii (Hilo, Maui, Honolulu, and Kauai), San Diego, and the Canadian ports of Halifax, Nova Scotia, and Saint John, New Brunswick. The number of different itineraries seems staggering for a four-ship cruise line. The Disney Magic will sail her traditional Eastern and Western Caribbean itineraries from Port Canaveral until the Disney Fantasy takes over those itineraries in late March. The Magic will stay around Port Canaveral a while longer, though, offering a few 7-night itineraries with Friday departures, and some 4- and 5-night Bahamas itineraries. Then, it's up to New York City (will she be greeted by spouting fireboats? ), where she will offer eight, 8-night voyages to the Bahamas and Port Canaveral... Wait, didn't the Magic just leave Port Canaveral? Yes, but how else can Disney take cruisers to Walt Disney World for the day (park admission and bus transportation included in the cruise fare)? But the New York story doesn't end there. 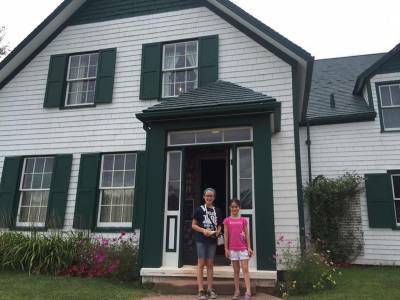 While based in New York, the Magic will also offer nine, 5-night cruises up the New England coast to the Canadian Maritime Provinces, and three, 2-night "cruises to nowhere." The Magic will wrap up her New York visit in early September, then head down to Galveston. Texas to finish out her year, offering a dozen 7-night Western Caribbean sailings (Grand Cayman, Cozumel, and Costa Maya), and one 8-night Holiday Cruise. Disney's many fans in Texas must be mighty happy around now. Disney is also mixing things up on the West Coast. The Disney Wonder will continue with her 7-night Mexican Riviera cruises for much of the fall, winter, and spring seasons from her permanent home base in Los Angeles. But in April, prior to heading north to Alaska, she'll take that one-time-only 15-night cruise back and forth to Hawaii. Then, it's up the coast to her new Alaskan itinerary base of operations, Seattle, Washington. It seems cruisers have been very unhappy with the high airfares into Vancouver, and have been flying into Seattle anyway before taking bus, train, or rental car north to Vancouver. Why not make life a bit more convenient and economical? To satisfy the United States' arcane shipping rules, Victoria, British Columbia will be added to the familiar 7-night itinerary of Tracy Arm Fjord, Skagway, Juneau, and Ketchikan. After her return to Los Angeles in mid-September, the Wonder begins another new itinerary, a series of four, 7-night cruises visiting San Francisco, San Diego, and Ensenada, Mexico. Are they trying to dodge the end of hurricane season? Then, in mid-October, it's back to the 7-night visits to the Mexican Riviera. Whew! While I haven't managed to catch it all (there are, naturally, several repositioning cruises, too), isn't this enough? Maybe. Let's not forget the excitement when the Disney Fantasy enters service! One bit of missing info at the news conference was the matter of whether the Disney Magic would depart from the Manhattan Cruise Terminal, a five-pier complex in the West 50s that has been berthing passenger ships for around 80 years. I have fond childhood memories of wishing my parents and relatives bon voyage as their ships slipped away from those storied piers. And back in those days, visitors could still board to see their loved ones off. "All ashore that's going ashore!" If not sailing from Manhattan, then it would have to be the one-berth Brooklyn Cruise Terminal, or the Cape Liberty Cruise Terminal in Bayonne, NJ. We can only read between the lines - nobody from New Jersey made a speech, and the gent from the New York Urban Development Commission thanked the company that manages the Manhattan and Brooklyn terminals. The Manhattan piers are currently being rehabbed, one pier at a time, with Brooklyn handling the resulting overflow. The Magic may sail from either, or both. We'll have to dig deeper. Another surprise was that the Disney Wonder, which we expected for a while would visit Hawaii, is being visited on an out and back itinerary from and to LA, rather than as part of the spring repositioning to Alaska. Just testing the waters, perhaps, for more frequent visits to the 49th State? 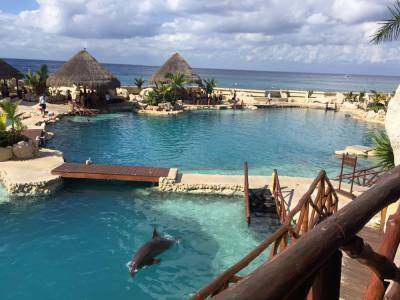 it'd be nice to have a choice of Mexican Riviera, Alaska, and Hawaii every year. What wasn't surprising was the addition of so many new U.S. home ports. A basic truth of 21st century cruising is airfare costs. Cruise lines find it much easier to fill their ships when their passengers can drive from home to the cruise pier. With airfare out of the picture, there will be quite a few families able to afford a Disney cruise for the first time. Some cruisers may be disappointed that similar choices are offered from several different home ports. Long, exotic itineraries might suit them better (I'd love a chance to visit the Galapagos Islands or the Eastern Mediterranean), but I can't fault Disney for focusing on reaching new cruisers. For now. There's always 2013 to look forward to. One of the great challenges in a journalist's life is getting new info from a Disney executive, and my brief interview with Disney Cruise Line President Karl Holz was a very pleasant version of one of those "no hints or slips" conversations. Karl is an easy-going, warm person to talk to, but if it's not in the press release, it's not on the table. "Might there someday be a Disney's Denali Resort?" Several cruise lines own hotels in Alaska, and since Disney's non-theme parks hotels, like Disney's Aulani Resort in Hawaii, are under Karl's wing, it seemed a reasonable question. There was nary a hint on his face to suggest an answer, and his spoken reply was the kind of perfectly-inflected "anything's possible," that gives absolutely nothing away. What do I make of all this? Now that Disney Cruise Line will have four ships, they're clearly going overboard to provide veteran cruisers with the kind of diverse choices they've been wishing for. It's a set of choices that will certainly keep Disney Cruise fans and their travel agents analyzing choices for a good long time to come. Now, what will they do to top themselves in 2013? 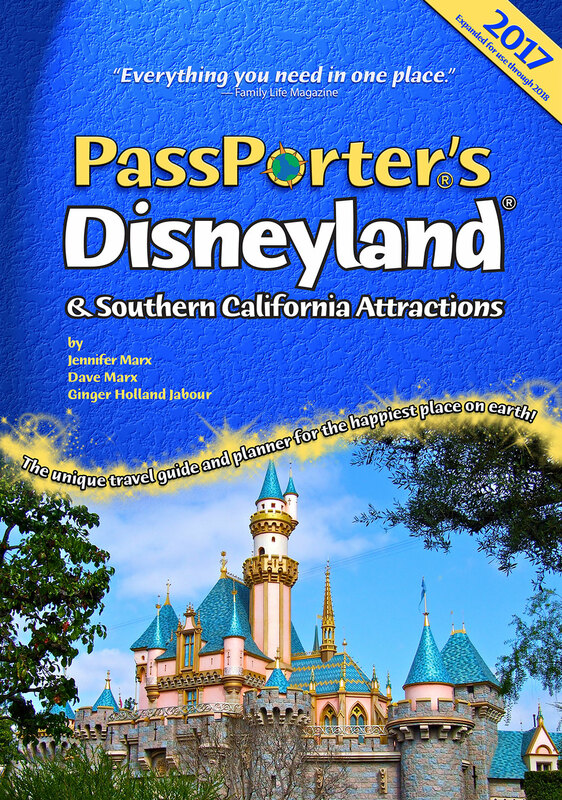 About the Author: Dave Marx is the co-founder of PassPorter Travel Press, as well as co-author of many PassPorter guidebooks, including the award-winning PassPorter's Disney Cruise Line guidebook.